8 years have passed, you are always in our thoughts and in our hearts. We miss you dearly. Rest in peace. 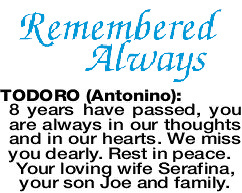 Your loving wife Serafina, your son Joe and family.